Now the tricky part is that my kids find it difficult to speak Filipino. I should’ve seen this coming and should have incorporated the language in our daily lives especially now that both lil’ JGs are in school. Thankfully at their age it’s still easy for them to pick up another language so as much as I can, I’m teaching my kids Filipino. It’s no rocket science that the best way to teach a language is to just use it. While it may sound easy, introducing another language to a child can be challenging. So here are some ways in which I try to teach my kids Filipino. There are days that are too funny to comprehend– I would speak in Filipino while my children try to understand what I’m trying to say while reacting confusedly in English. It’s tough to try and make them understand especially since some Filipino words aren’t literally translatable to English. Best I could do is speak Filipino and let them be familiar with the words I use. Do take note that–just like teaching another language to anyone– there will be lots of questions and puzzled looks after almost every incomprehensible sentence, do not give up instead, just go with it. To supplement speaking the language, you must also write it. For parents like me with kids aged 2-7 best to start with easy words–those two syllable words that are often used at home on a daily basis. Stick some post-its on the things that you normally use at home such as cup (baso), water (tubig), clock (relo), chair (silya), milk (gatas). If your child still doesn’t know how to read, just use the post-its as reference for when you use the item while speaking the language. This will give them a sense of familiarity with the Filipino words you regularly use. I know social media and technology are great factors when it comes to our children’s lives. These tools when used correctly can help them learn. I admit I have a love-hate relationship with my children’s gadgets–it’s how my kids learned colors, shapes, alphabet & numbers when they were younger–but now more than ever is the perfect opportunity for me to utilize technology to help my kids learn even more. It’s really inevitable for them not to use gadgets but with proper guidance and control, they can greatly benefit from it. 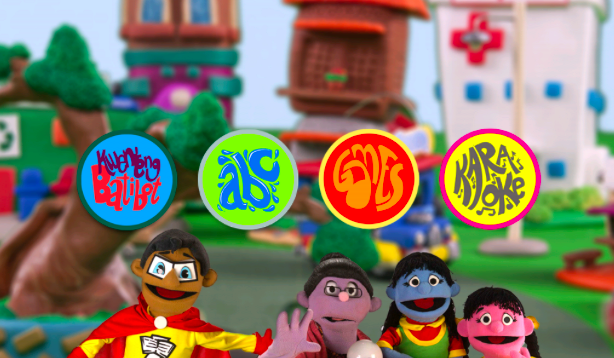 Thankful that my favorite childhood TV show, Batibot has released its very own app where kids can watch episodes and play games that encourage them to learn Filipino. Download Batitbot TV app and Batibot games app via Google Play for android users. Oooh I hope it becomes available for iOS too! So far these ways of teaching my kids Filipino are helping them like the language enough to try speaking it. Though they’re still a bit confused on certain words that sound the same in English and Filipino–yellow & yelo (ice)– at least they’re having fun while learning. You can also get tips on how to teach your kids Filipino by watching the Kids Know It episode by Better Me. It’s really never too late nor early to teach your child Filipino. Don’t wait until they feel uncomfortable learning the language or needing a tutor for it. Got any other tips? Please share them away!